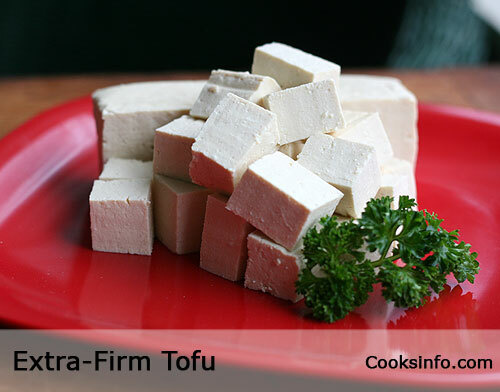 Extra-Firm Tofu is a coagulated soy-bean product. To make it, soy milk with a coagulant is poured into a vessel or mould. A cotton cloth is placed over top. When the bean cured has solidified, a weight is pressed on top to force some water out. 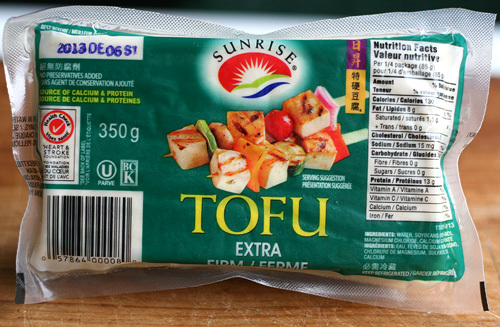 Owing to its lower water content, extra-firm tofu is more solid than any tofus labelled firm, medium-firm, soft, etc. When sliced, it almost appears to have a “grain” to its texture inside. It retains its shape better when cut and tossed about in cooking. If you want to cube tofu for frying, this extra-firm tofu — or firm — is the kind to use. Unless you have a recipe to follow that directs otherwise, marinate the cubes for an hour or so before cooking in a blend of soy sauce, flavoured vinegars, oyster sauce, etc. Then bake or fry sprayed with cooking spray, or in oil. Extra-firm tofu will be slightly higher in calories (and fat) than other tofus because per gram, you’re actually getting more tofu and less water. Firm tofu freezes better than soft or silken tofus. You can freeze for up to 3 months.